SHAH ALAM: A fire officer told the Coroner’s Court here yesterday that he lodged a police report stating that Muhammad Adib Mohd Kassim was assaulted during the riots at the Sri Maha Mariamman Temple last year although he did not witness the incident. Subang Jaya Fire and Rescue station operations head, Senior Fire Officer 2 Badrul Hisyam Salim @ Ali, 39, said he made the assumption that Muhammad Adib was assaulted based on what happened to Emergency Medical Rescue Service (EMRS) van driver Ahmad Shahrill Othman as the two of them were together in the van. Badrul Hisyam, who is the fifth witness, said this when asked by deputy public prosecutor ​​​​​​​Hamdan Hamzah, who is also the coordinating officer for the inquest, on the third day proceeding to determine the cause of Muhammad Adib’s death. Hamdan: You lodged a report with Shahrill by stating that the deceased sustained serious injury from being dragged and assaulted by the rioters. How do you know that the deceased was assaulted? Badrul Hisyam: Indeed, I did not see the deceased being assaulted, but from what Shahrill told me, that his side of the van door was tugged by a group of people, I assumed that the deceased also experienced the same. Hamdan: Did you make any amendments to the police report? Badrul Hisyam: I did not, but I had informed the matter to the investigating officer. 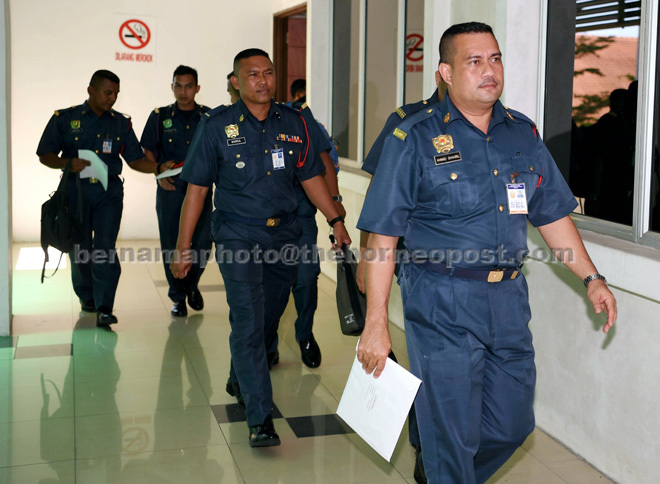 He also told the court that during the incident, communications between the Fire Rescue Tender (FRT) vehicle and the EMRS van Muhammad Adib was cut off. Badrul Hisyam said he was in the FRT vehicle, which was in front of the EMRS van. “I used the Goverment Integrated Radio Network (GIRN) to contact the EMRS van which Adib and Shahrill were in, but there was no connection. It showed blind spot. “When I saw the public behaving in a suspicious manner, I told my men not to leave the FRT, but Mohd Hazim Mohd Rahimi and Anuar got down to put out the flame of burning car… and I quickly told the others to inform Mohd Hazim and Anuar,” he added. Recalling the incident further, Badrul Hisyam, said the FRT driver, Md Elizza Mohd Noor, then moved the vehicle backward and Anuar hopped in. “At that time, I felt threatened, afraid and the glass screen on the left was smashed. I also held on to the door because there were attempts to knock the door. “When the FRT moved backwards, it went spinning. They (rioters) did not follow us. I think if they do, we would not have been able to get out from the location,” he said, adding that the FRT went straight to the Subang Jaya district police headquarters to lodge a report. He said it was only when he arrived at the police station that he realised Muhammad Adib was missing. Asked by lawyer Kamaruzaman Abdul Wahab, who is holding a watching brief for Muhammad Adib’s family, on the communication between the FRT vehicle and the EMRS van, Badrul Hisyam said there was no communication between the two vehicles even after the attack. Questioned by another lawyer, Syazlin Mansor, who appeared on behalf of the Housing and Local Government Ministry, the witness said he did not have time to use his handphone to contact Muhammad Adib during the incident. Syazlin: How do you know there was blind spot connection? Badrul Hisyam: When using Girn, there is a signal “no connection”. I used Girn during and after the attack to contact the EMRS van, but there was no connection. Syazlin: Why did you not use a handphone? Badrul Hisyam: I did not know where my handphone was. I had to protect myself and there was no response from the EMRS van. Meanwhile, Ahmad Shahrill said he did not leave the EMRS van because he would be committing suicide had he done so. The third witness said no one was hit or trapped when the van spun to the left after being hit from the rear by the FRT vehicle, which was then reversing to avoid the crowd. Ahmad Shahrill said he did not realise whether Muhammad Adib, who was seated beside him in the van, was dragged out of the vehicle or thrown out. “The van was being attacked then and there was no communication between me and him (Muhammad Adib) ,” he said. Muhammad Adib, 24, who was a member of the EMRS of the Subang Jaya Fire & Rescue Station, was seriously injured during the riots at the temple on Nov 27 last year. He was alleged to have been assaulted by several rioters.